This slot is a lot of fun. You’ll be defending South Park from the evil ‘Doctor Chaos’, with 3D action in front of the reels based on the familiar characters. The theme is colorful, and the attention to detail you would expect from NetEnt makes a big difference. Just one example, when you hit a winning combination you’ll hear ‘sweet’. There are 20 win-lines, though this is fixed and you’ll choose ‘levels’ as well as your coin value. 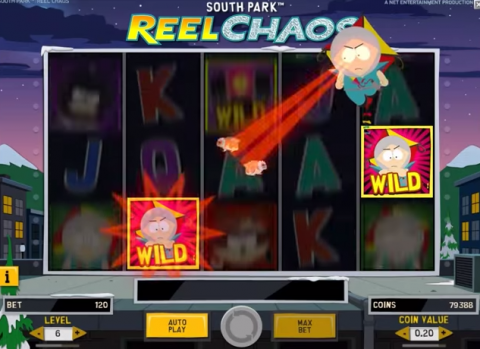 Wins come in many different ways, and the stacked wilds in-reel feature can result in some big payouts (Cartman climbs the reels turning them wild). The action in front of the reels and fighting characters (or wild hamsters) make this a frantic game at times. You can get a bonus round where Cartman defends the school, which is where the biggest wins of all come from. This is a break out game with a different (smaller sized) block of reels, with the action (and multipliers) going on over the top of it. Definite yes, this is a must-play for anyone who appreciates the South Park brand of humor.